Between its original release on consoles and this slightly delayed PC port, I've had a lot of time to think about Assassin's Creed III. That's not a luxury I have with a lot of reviews, and sadly one that does not bode well for Ubisoft's biggest holiday release. Despite its big budget production and impressive set pieces, I found myself liking this sequel less and less with the passage of time. From the way it handles Desmond's story to a hero I just couldn't connect with, much of Assassin's Creed III left me cold. But let's not get too far ahead of ourselves. This is the much-anticipated final chapter for Desmond Miles, a bartender who may be the man to save all of humanity. It's the exciting conclusion we've been waiting for since Altaïr Ibn-La'Ahad killed his first victim in 1189. After three games starring Ezio Auditore da Firenze, we finally have a brand new assassin and, more importantly, a fresh time period to explore. Forget 15th century Italy. The storyline jumps several hundred years into the future to depict an era that is personal to many Americans. 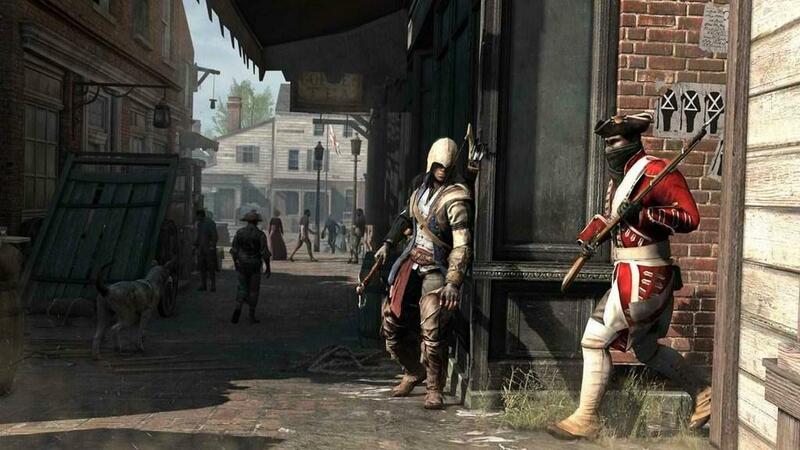 Set in the mid to late 1700s, Assassin's Creed III is about the birth of the United States. Instead of hobnobbing with Leonardo da Vinci, we spend our time working alongside George Washington, Benjamin Franklin, Paul Revere and other historical figures. If you're a high school history teacher, Ubisoft's newest game is simultaneously your best friend and biggest nightmare. Assassin's Creed III starts out strong, thanks to an extended introduction where you play Haytham Kenway. Over the course of several hours we see this man make his way from England to the new world of America. Haytham is on a mission and not even an insanely long boat ride across the Atlantic Ocean is going to stand in his way. At the same time, we're taught the basics of hand-to-hand fighting, manning a boat and patience. Just as it looks like the tutorial is coming to a close, the game hits you with a few major twists...and two more hours of learning the ropes of this brand new world. Now the emphasis is on climbing tall buildings, tracking enemies, traversing the dangerous countryside, hunting and working to save a struggling Native American tribe. It's in this final lesson that Haytham falls for a Mohawk woman named Kaniehti:io. And even though this is not a love affair that can last, it does create a mixed race baby that will go on to change the world for the better. At long last, we're finally been introduced to young Ratonhnhake:ton, who we (and the game) will call Connor from here on out. Connor is a lot like any other kid; he's full of energy and loves playing hide and seek. But his carefree days come to an end when he witnesses his village burned to the ground by Charles Lee, a friend and colleague of Haytham Kenway. To make this situation even more tragic, Connor's mother dies after being trapped in her burning house. All this is too much for our young hero, who vows to get his revenge on the men responsible for this vicious attack. Before Connor can avenge his mother's death, he must first train to become a master assassin. He does this with the help of Achilles Davenport, inarguably the most interesting character in all of Assassin's Creed III. Achilles is an old assassin who doesn't seem very interested in taking on a student. He's a recluse who lives far away from the rest of society. His house is broken down and a little rickety, which could also be said about the aging black man. But Connor won't take no for an answer and eventually wears the elder assassin down. Cue training montage. After hours of set up, we eventually get to a point where Connor can take missions that resemble past Assassin's Creed games. We do this in Boston, where there are people to kill and missions to take on. All of the old mechanics come into play here, including sneaking through large crowds, tearing down wanted posters and climbing tall buildings to sync the feed. We also meet up with many of this nation's founding fathers, each with their own problems to solve. Occasionally these misunderstandings can be worked out by simple communication, but most of the time it takes a hatchet to the forehead to enact real change. Many of the missions revolve around well-known historical events. At one point you're there helping dump tea during the Boston Tea Party. Another instance has Connor riding with Paul Revere as he warns that the British are coming. All this is pretty goofy, though in the lovable way you expect from the Assassin's Creed series. 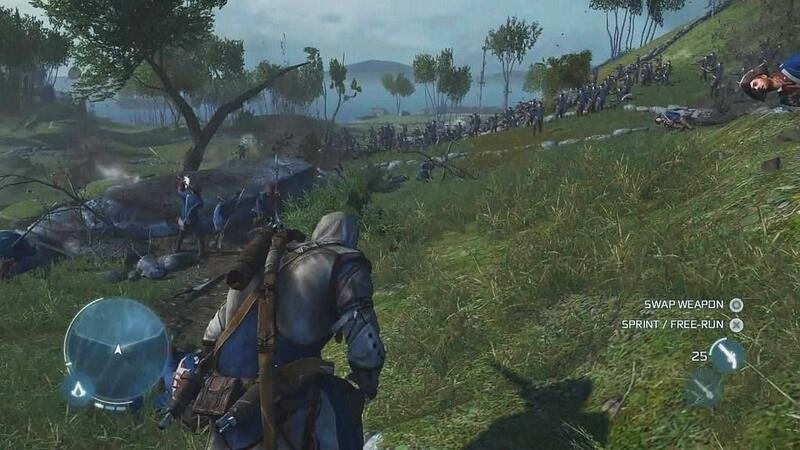 With so many big events to choose from, it's a shame Connor didn't find his way into even more historical moments. When not rewriting everything we know about American history or training with Achilles, Connor is forced to take on a lot of very familiar mission types. He sneaks behind targets listening to their conversations. He hides on rooftops waiting for the perfect time to pounce. He chases after bad guys through burning structures. The setting may be different, but this is the Assassin's Creed you know and love. 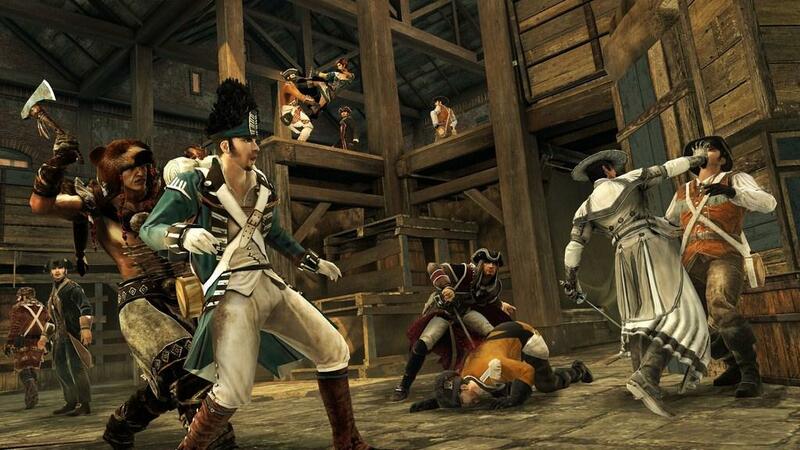 The American Revolution setting does allow for a few fun additions to the gameplay. For starters, there's much more open wilderness to explore than ever before. Instead of the narrow path of forest we've seen in past games, Assassin's Creed III gives us several large open world forests. The result reminds me of one of my favorite sandbox games, Red Dead Redemption. The good news is that Connor has an uncanny ability to quickly scurry up tall trees and leap from branch to branch. This allows the developers to shoehorn in a lot of the mechanics that makes the franchise memorable (climbing to the highest possible locations, pouncing down on confused enemies, etc.). If all that sounds like a nightmare to control, don't worry; Assassin's Creed III makes some much needed upgrades to the core mechanics. It used to be that players would spend their entire time holding two buttons to run, climb and make daring leaps. Now all this is done with a single button. Better still, the game will automatically stop the player from making dangerous jumps. Couple this with a better path finding system and you have the best controlling Assassin's Creed game yet. Like most games in the franchise, Connor's adventure features a treasure chest full of mini-games and optional modes. 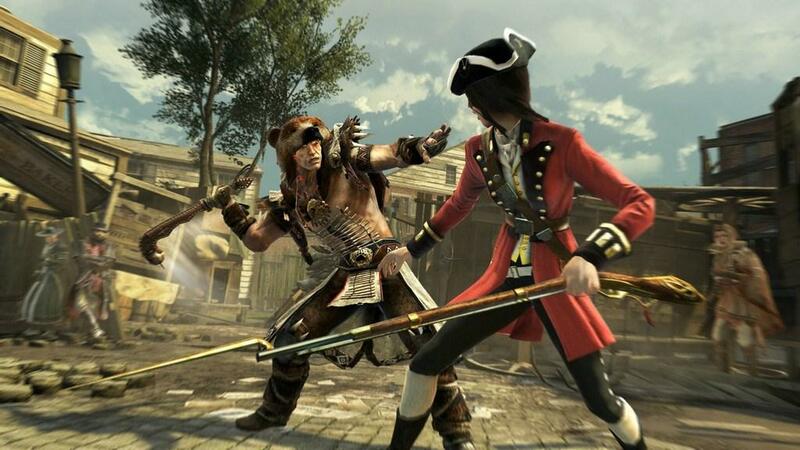 Assassin's Creed III adds hunting to the repertoire. You will also be able to trade items and recruit people to work on your homestead. The most exciting new mode involves large scale naval battles. Although I was dreading it going in, I actually had a lot of fun shooting heavy cannon balls at my opponent's ship. The controls are easy and the fast-paced combat doesn't overstay its welcome. It was while trying to figure out the convoluted trading system that I started to sour on the game. 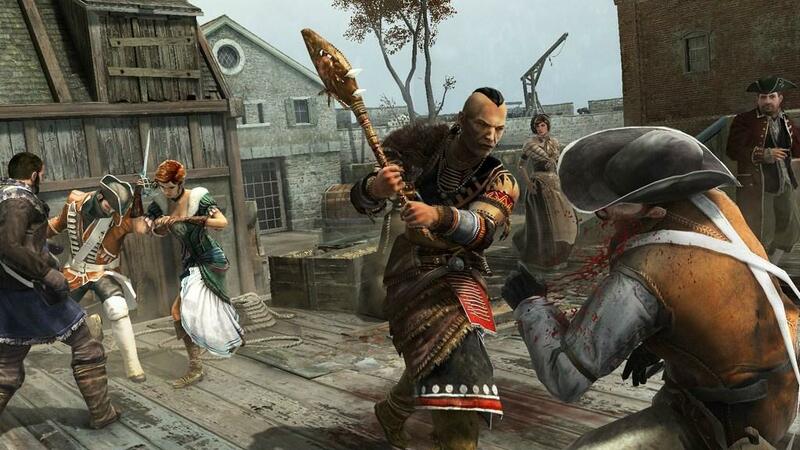 Assassin's Creed III bolts on a few too many mechanics for its own good. While some parts of the game feel streamlined, too much of it was needlessly complicated. What's worse, the secondary content is mostly boring. But at the same time, huge chunks of Connor's story feels like filler. I found myself having a difficult time connecting with single-minded Connor. This is a man on a mission, which apparently means he has no time to hit on women or make corny one-liners. He's a character with a thick shell I just couldn't penetrate. I find almost everything about this game to be interesting, yet there's nothing spectacular about this character. He's merely the vessel for this underwhelming story. Let's not forget about poor Desmond, who gets in on the action with his own set of annoying levels. Thankfully, all of the first-person stages from Revelations have been left in the past. Instead we get a set of fairly traditional platforming puzzles, frustrating Tomb Raider-style climbing/jumping challenges. Not only are these sections boring, but they don't look very good. It feels like these sections were added on at the last minute by Ubisoft's B-team. It should come as no surprise that this is Desmond's final chapter. The developers have been saying for years that Assassin's Creed III would tie up the storyline, while also leaving things open enough for future sequels. While others may find it dull, I was excited to see what Desmond's fate would be. Perhaps that's why I was left disappointed by the game's terrible conclusion. Without giving too much away, the ending undermines a number of key moments that happened in past Assassin's Creed games. It also opens up a bleak future for the direction of the franchise. Ending aside, I found myself equally impressed and disappointed. For every exhilarating moment, there's a frustrating chase sequence. I stopped caring about Connor's plight long before it concluded, thanks in large part to a weak villain. Thankfully the setting (which includes both Boston and New York City) is large and full of life. It's just a shame the things you do aren't more exciting. I was pleasantly surprised to see the quality difference between this PC port and the original console releases. The textures are sharp, the facial animation isn't as buggy and I didn't run into nearly as many game freezing hiccups as my Xbox 360 version. On the other hand, it took a little doing to get this running properly on my setup. If you have a choice between versions, the PC is the way to go. While my opinion of the game has soured over the last two months, Assassin's Creed III is still a strong sequel with a number of memorable moments. Ubisoft is the master at telling this kind of story, which may explain some of my disappointment. With a better protagonist and a more satisfying conclusion, this could have been a real contender for game of the year. As it is, Assassin's Creed III will have to settle for being little more than a pretty good sequel. Assassin's Creed III may not be the sequel I hoped for, but it remains another solid entry in the time-bending franchise. The setting is a lot of fun to explore and the first half really works on a storytelling level. Unfortunately, the quality is thwarted by a weak villain, boring hero, and frustrating mission designs. Couple that with a disappointing ending and it's hard to be enthusiastic about Ubisoft's latest Assassin's Creed game.